On 7 August 1942, just eight months after the dramatic events at Pearl Harbor, the United States First Marine Division stormed ashore on the island of Guadalcanal. It was the opening gambit of the land war in the Pacific. 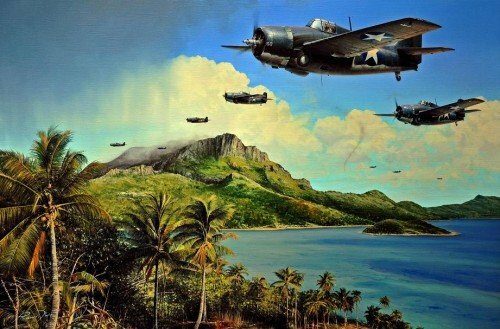 Richard Taylor’s new masterpiece portrays Captain Joe Foss as he leads the F4F Wildcats of VMF-121 back to Henderson Field after a day of desperate fighting against the Japanese in the skies over the steaming jungles of Guadalcanal in November 1942 - it would be another three months before the island was finally secured. 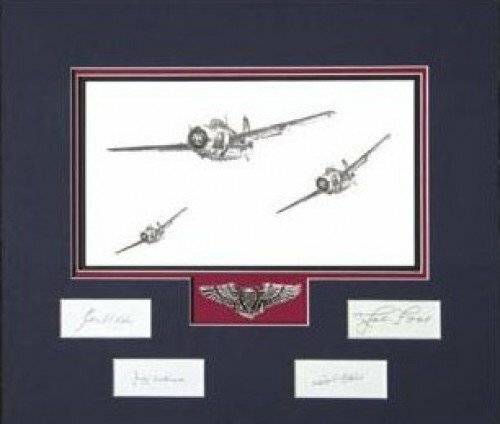 Joining artist Richard Taylor, each print in this limited edition has been individually signed in pencil by TWO highly-distinguished Pilots who flew the Wildcat in combat, and fought in the Pacific Theater. With such a limited number this edition is likely to sell out quickly so please contact me for availability.